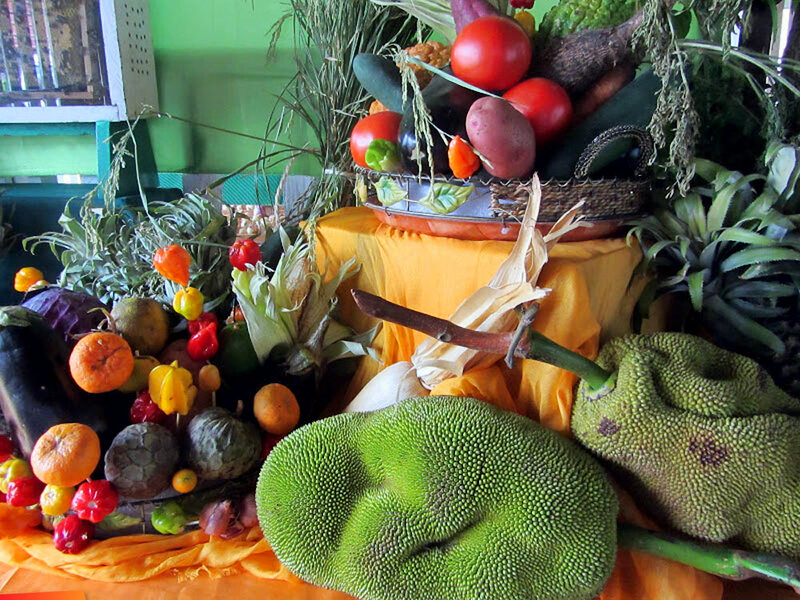 Fruit display at the 2012 Belize National Agriculture And Trade Show in Belmopan. Every fruit / vegetable / legume grown in Belize was represented. The jackfruit (Artocarpus heterophyllus) is a species of tree in the Artocarpus genus of the mulberry family (Moraceae). It is native to parts of South and Southeast Asia, and is believed to have originated in the southwestern rain forests of India, in present-day Kerala and coastal Karnataka. This tree is widely cultivated in tropical regions of India, Bangladesh, Sri Lanka, Vietnam, Thailand, Malaysia, Indonesia and the Philippines. Jackfruit is also found in East Africa, e.g., in Uganda and Mauritius, as well as throughout Brazil and Caribbean nations such as Jamaica and Belize. 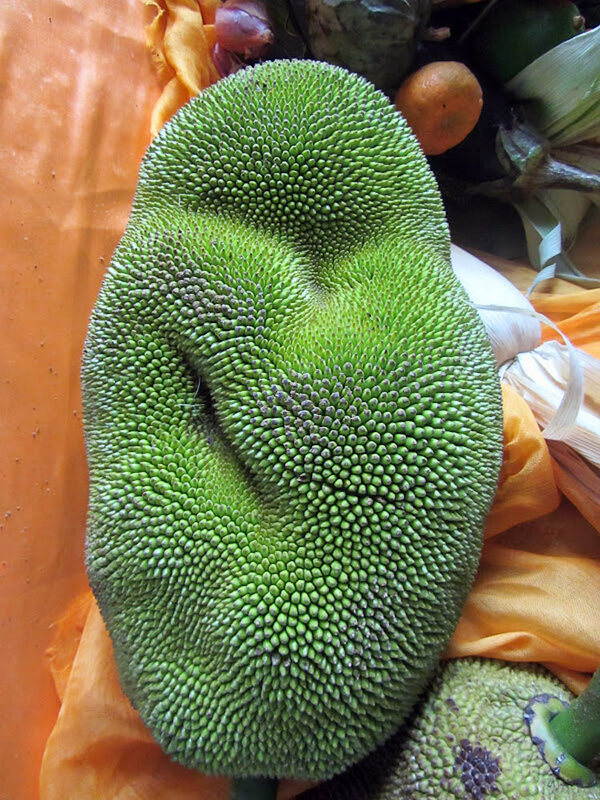 The jackfruit tree is well suited to tropical lowlands, and its fruit is the largest tree-borne fruit, reaching as much as 80 pounds (36 kg) in weight and up to 36 inches (90 cm) long and 20 inches (50 cm) in diameter. It can be eaten unripe (young) when cooked, or ripe uncooked. The seeds may be boiled or baked like beans. The leaves are used as a wrapping for steamed idlis. Ripe jackfruit is naturally sweet with subtle flavouring. It can be used to make a variety of dishes, including custards, cakes, halo-halo and more. Ripe jackfruit arils are sometimes seeded, fried or freeze-dried and sold as jackfruit chips. Seeds from ripe fruits are edible and are prepared by boiling in salted water for about 25 minutes. They have a milky, sweet taste. In many parts of India, roasted salted seed is also eaten and considered a delicacy. The wood of the tree is used for the production of musical instruments. Hardwood from the trunk can be carved out to form the barrels of drums used in the gamelan, and in the Philippines, its soft wood is made into the hull of a kutiyapi, a type of Philippine boat lute. It is also used to make the body of the Indian string instrument veena and the drums mridangam and kanjira; the golden yellow-coloured timber with good grains is used for building furniture and house construction in India. The ornate wooden plank called avani palaka made of the wood of jackfruit tree is used as the priest's seat during Hindu ceremonies in Kerala.